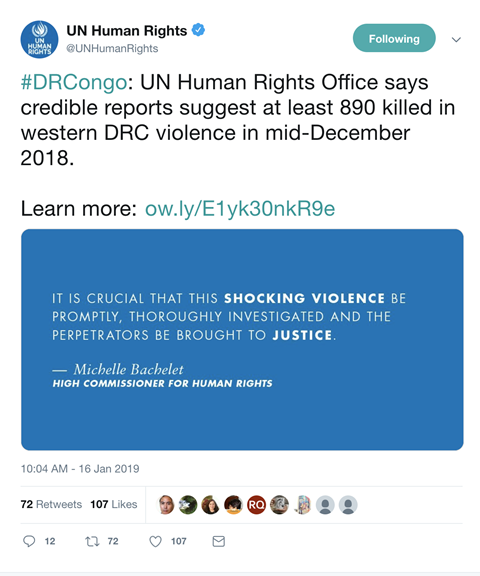 While the global media focuses on the ongoing electoral crisis in the Democratic Republic of the Congo (DRC), on 16 January the Office of the UN High Commissioner for Human Rights (OHCHR) reported that more than 890 people had been killed in inter-communal violence in Mai-Ndombe province between 16 and 18 December. Attacks and reprisal killings between the Banunu and Batende communities in several villages of Yumbi territory reportedly escalated after a dispute related to the burial of a local chief. 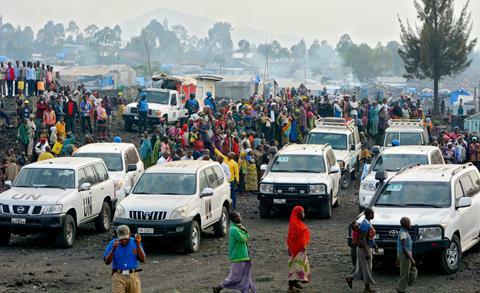 Thousands of people have been internally displaced by the clashes and an estimated 16,000 people fled to the neighboring Republic of Congo. 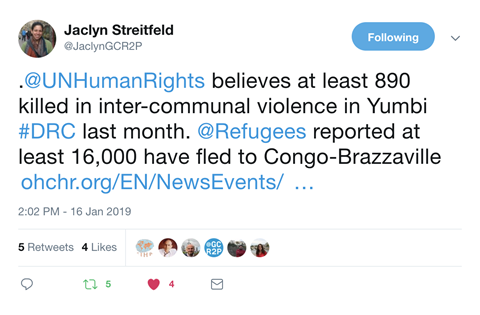 According to OHCHR, at least 465 houses and buildings were also burned down or pillaged, including the local office of the national election commission (CENI). While tensions stemming from land disputes have existed between the Banunu and Batende communities for years, the latest fighting led CENI to declare that villages in Yumbi were unsafe for both electoral workers and voters. As a result, voting in the 30 December general election was postponed in the area until March. The DRC government and the UN’s Joint Human Rights Office have both launched investigations into the violence. Inter-communal violence in Yumbi erupted at a time when the government and the international community are focused on a number of complex challenges facing the DRC, including an Ebola outbreak, ongoing attacks perpetrated by armed groups throughout the east of the country and disputes regarding the legitimacy of the December election. OHCHR has reported 34 election-related deaths and the arbitrary detention of 241 people since provisional election results were announced on 10 January. On Sunday, 20 January, the Constitutional Court ruled that a complaint filed by candidate Martin Fayulu was inadmissible, affirming the election of Felix Tshisekedi as the next president of the DRC. 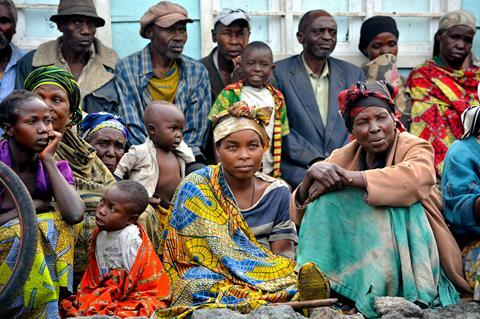 The DRC government must hold perpetrators of inter-communal violence in Yumbi accountable. Local political leaders should take steps to prevent the recurrence of violence, including through community-based reconciliation initiatives. In light of the declaration by the Constitutional Court it remains essential that all political leaders refrain from inciting violence and that the security forces respect the right of all Congolese to freedom of assembly, peaceful protest and political expression. It has been over a month since the UN Security Council (UNSC) adopted Resolution 2451 endorsing the Stockholm Agreement – a tentative step towards negotiating a political solution to a conflict in Yemen that has led to the largest humanitarian crisis in the world. 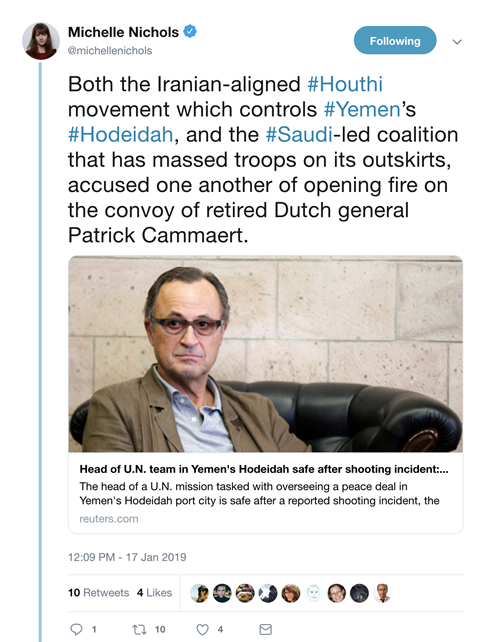 Although the Stockholm Agreement has the formal support of all sides to the conflict, a recent escalation of armed hostilities has placed the future of the Agreement, and especially the ceasefire in the crucial port city of Hodeidah, at risk. 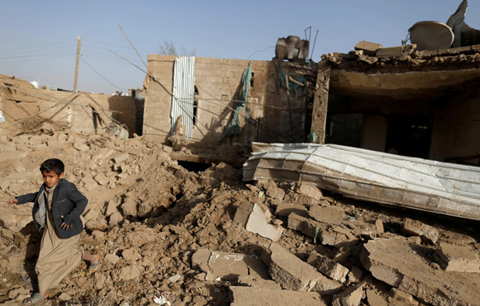 Although the ceasefire established in Hodeidah during December has largely been maintained, a growing number of violations have been reported across the city. On 17 January the convoy of the head of the UNSC-mandated Redeployment Coordination Committee also came under fire. 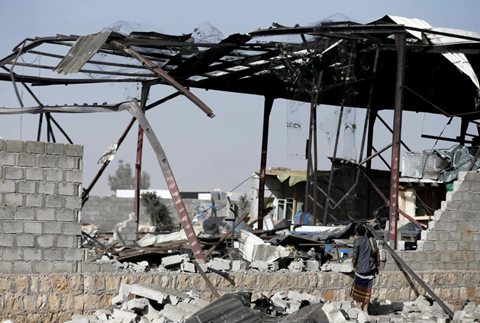 Both parties to the conflict have failed to fully redeploy their forces outside the city by the 8 January deadline and if the ceasefire collapses in Hodeidah – the entry point for 80 percent of the food and fuel imports upon which over 22 million Yemenis currently depend – the lives of hundreds of thousands of civilians will be at risk. None of the Stockholm Agreement’s other key components have been fully implemented and a date and location for a second round of talks has not been announced despite the intention of the UN Special Envoy to hold them during January. Houthi and Yemeni government forces were also unable to reach an agreement on a prisoner exchange during meetings in Jordan last week. 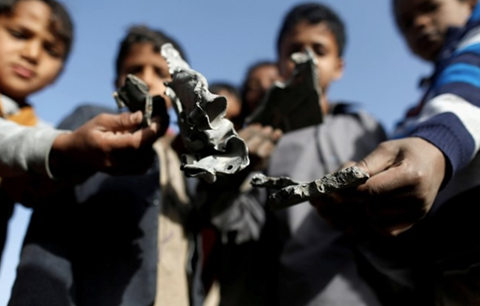 Additionally, on 20 January the Saudi Arabia and United Arab Emirates-led military coalition carried out dozens of airstrikes on the Houthi-controlled capital city, Sana’a, in response to a drone attack targeting a Yemeni government military base. Meanwhile millions of Yemenis continue to face the threat of starvation. According to the Integrated Phase Classification system, as of December an estimated 15.9 million Yemenis – over half the population – are severely food insecure. Save the Children has also reported that 85,000 children under five may have died of starvation since April 2015. It is crucial that the political momentum from the December breakthrough is not allowed to dissipate. The UNSC must facilitate the swift deployment of the UN Mission that was authorized on 16 January to monitor the fragile Hodeidah ceasefire and assist with the full implementation of the Stockholm Agreement. 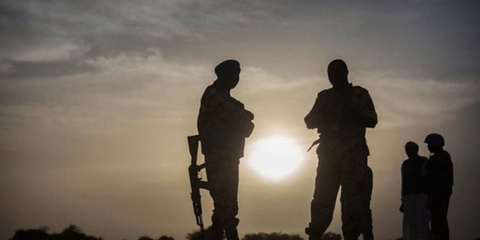 On Sunday, 20 January, ten Chadian peacekeepers from the UN Mission in Mali (MINUSMA) were killed during an attack on the Aguelhok base in the northwest of the country. 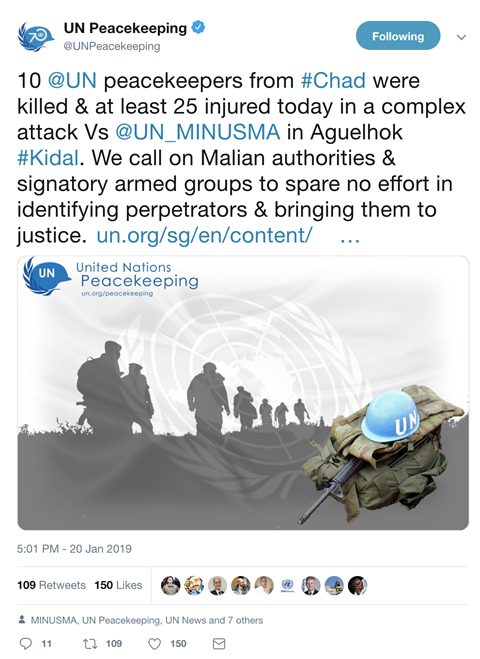 In a statement UN Secretary-General António Guterres emphasized that “attacks targeting United Nations peacekeepers may constitute war crimes under international law.” A local affiliate of Al-Qaeda claimed responsibility for the attack. MINUSMA has become the deadliest peacekeeping mission in the world, with 116 peacekeepers killed in malicious acts since its establishment in April 2013. Last year a total of 98 peacekeepers were killed while serving in 14 UN missions, with 27 peacekeepers killed in malicious acts. 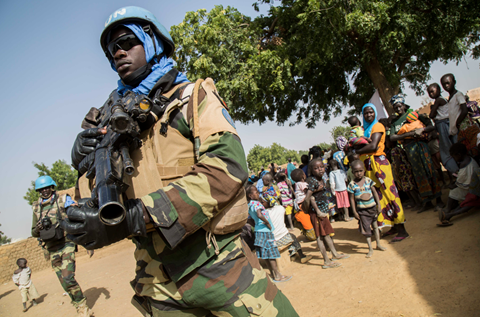 While the number killed during 2018 was lower than in previous years, major threats to the safety of peacekeepers persist. Every day UN Peacekeepers uphold the international community's Responsibility to Protect the world’s most vulnerable populations through both conflict prevention and civilian protection operations. The UN Secretary-General launched the Action for Peacekeeping (A4P) initiative in March 2018 to address the persistent challenges facing modern peacekeeping. For peacekeeping missions to effectively uphold increasingly complex mandates it is essential that they are provided with adequate resources and that all UN member states fulfill their funding commitments. Enhanced pre-deployment training is also essential, including on the identification and amelioration of risk factors that may lead to mass atrocity crimes.